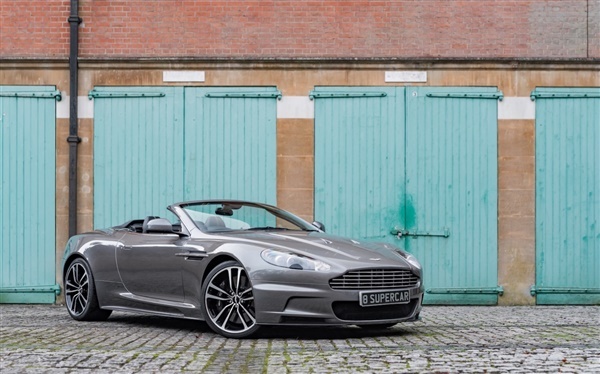 This DBS Volante Sportshift is perhaps one of the most majestic-looking modern convertibles on the market. The DBS Volante can be treated as the perfect GT car; the beautifully trimmed interior, Bang and Olufsen sound system, multiple interior comforts and smooth yet powerful V12 engine create a luxurious atmosphere to be enjoyed for extensive periods of time. The specifications of this Aston Martin include the 6 litre, 510bhp V12, with the Touchtronic 2 gearbox. The optional extras at Aston Martin when producing the DBS were mainly revolving around the wheels. This example has the most desirable combination of the diamond cut wheels and hammerhead silver exterior paintwork, complimenting each other in producing a beautifully sleek exterior presence. With 45000 miles and extensive Aston Martin service history, this DBS Volante is ready to continue its grand touring journey or to be enjoyed as a majestic Sunday driver. This advert is for an Aston Martin DBS, click Aston Martin DBS in Staines to see more cars like this in the local area. Want to search further afield? Click Aston Martin DBS in Greater London to search for similar cars in the wider Greater London area.